This private working plantation has fruits and vegetables in continuous cultivation including coconuts, bananas, papaya, mangoes, pineapples, oranges, lime, cocoa, plantain, plums, avocado, tamarind, breadfruit, okra, tomato, cucumber, yams, ackee, carrots, calaloo, and allspice. Fish are raised in ponds fed by our natural mineral spring which also provides our freshwater requirements for the entire property. 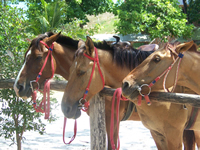 Rhodes Plantation offers quality horseback riding. The magic and mystery of Jamaica, often eludes the casual visitor. 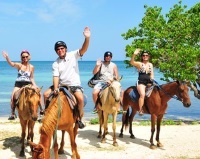 With Rhodes Horseback Riding, whether you are a beginner, intermediate or advanced rider, you will explore Jamaica as you never have before. 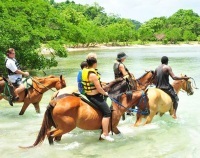 Over 70 Horses graze freely in the hills when not in use for horseback riding and our morass (Jamaican swamp) is one of the largest crocodile reserves in Western Jamaica with over 70 residents and an adjoining lake simply named "Crocodile Lake". Other animals living on the property include geese, guinea hens, chickens, roosters, ducks, goats, mongoose, crabs, cats, dogs, doves, parrots, humming birds, doctors birds, myna birds, seagulls, pelicans, sandpipers, herron, vultures, and even peacocks. Visit the mangroves, birdwatch, snorkel along the extensive reefs, see the crocodile reserve, ride one of the horses throughout 550 lush tropical acres or ride in the water along the coast, dine at one of two restaurants, relax in innovative, ocean side, infinity style, mineral spring pool, visit the bird sanctuary and observe resident geese, ducks, peacock, guinea hens, and other cherished animals. The terrain covers all that Jamaica has to offer; from beaches to coral coastline, to mountaintops as high a 550 feet affording excellent views all the way to negril. The lush tropical jungles feature impressive stands of ancient bamboo and numerous types of trees and other rainforest vegetation creating a bird watchers paradise.